A research team from Wayne State University in Detroit published a paper in the April 2016 issue of Journal of Clinical Investigation that provides a paradigm shift in the understanding of cellular and molecular mechanisms underlying diabetic peripheral neuropathy (DPN) and wound healing in the treatment of corneal and skin diabetic ulcers. A release from the university explains that DPN is one of the earliest and most common pathological manifestations of diabetes, occurring in more than 75 percent of diabetic patients. It can cause ulcerations in the cornea and skin, where it often leads to neuropathic pain and foot ulcerations that often require amputation. Understanding of the development of DPN is mostly obscure, partly due to the lack of good animal models available. 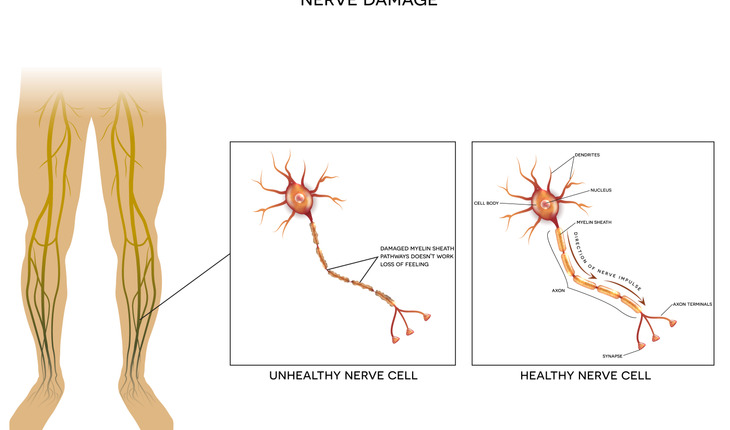 Because of this, immune-neuron interactions have been a major focus of researchers in the past few years. According to Fu-shin Yu, Ph.D., professor of ophthalmology and director of research at the Kresge Eye Institute of Wayne State University, the cornea is the most densely innervated mammalian tissue and is an excellent model to study the underlying mechanisms for DPN. Yu and his research team discovered that in the diabetic mouse cornea, the density of sensory nerve fibers and their endings are drastically reduced, similar to patients with DPN. Moreover, the regenerative capacity of corneal nerves following wounding is impaired in the corneas of diabetic patients compared to normal B6 mouse corneas. This phenomenon coincided with a reduction in the number of infiltrating dendritic cells in the wounded corneas of diabetic mice, leading to the conclusion that sensory neuropathy is related to this decline in the dendritic cell population in the diabetic cornea. Furthermore, dendritic cells were found to guide the regenerating corneal sensory nerve fibers after wounding; this association is disrupted in the diabetic corneas. Yu said the impairment of sensory nerve regeneration in diabetic corneas is due to decreased ciliary neurotrophic factor, as evidenced by the fact that dendritic cells express ciliary neurotrophic factor (CNTF) in normal and healing corneas but decrease in diabetic corneas due to the reduced infiltration of dendritic cells. Dendritic cells mediate sensory nerve innervation and regeneration through direct cell-to-cell contact and CNTF secretion. In a diabetic cornea, hyperglycemia disrupts DC-sensory nerve interactions, resulting in the impairment of sensory nerve regeneration post-wounding and diabetic peripheral neuropathy in the cornea. However, the process appears to be reversible. Yu further mentioned that the study showed that the application of exogenous CNTF — and, more strikingly, its soluble receptor CNTFR-alpha — can partially reverse the adverse effects of diabetes on sensory nerve and nerve regeneration. He concluded that CNTFRα may be a valuable alternative to CNTF in treating neuron degenerative diseases such as DPN, as it can increase the utilization of naturally produced CNTF without undesired side effects associated with exogenously added CNTF. “These novel findings have potential to develop new dendritic cell-based cell therapy to treat diabetic peripheral neuropathy and ulcerations in the cornea and skin,” Yu concluded.